Sweet yoghurt (often filled with sugar) is being pushed aside in favour of yoghurt with savoury ingredients and toppings, like spices, olive oil, cucumbers, pulses, beans, seeds, and garlic. In a new series of blogs for 2017 we’re bringing food operators the latest trends for the on-the-go food market. From Acai bowls and Poke, to Bao burgers and rolled ice-cream – we’ll be taking a close look at the must-have dishes essential for any 2017 take-out menu; and we’ll be exploring why these dishes have risen to popularity so quickly. Made by mixing Greek yogurt with savoury ingredients you might find in a dinner recipe— like carrots, beetroot, avocado and tomato – savoury yoghurt has become an instant hit with health conscious consumers. 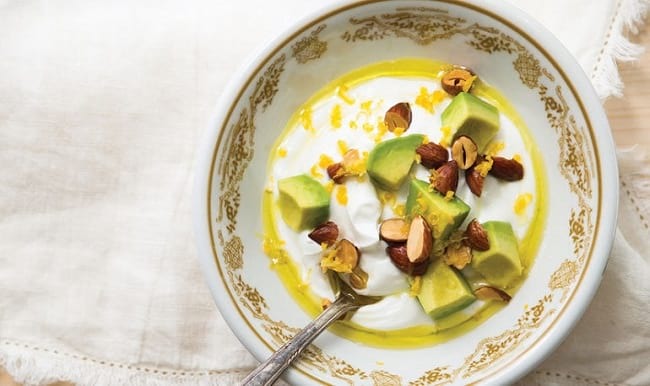 Why has savoury yoghurt become so popular? Well, Greek yogurt goes well with just about anything and, because of its nutritional benefits, it makes a perfect replacement for fattier ingredients, or a healthier alternative to other yogurts that are high in sugar. It contains 40 per cent less sugar, 38 per cent less sodium, and more than twice the amount of protein than traditional yogurt. Also, when topped with vegetables, pulses and beans it can be a great way to reach your five a day. Alongside the health benefits, the multi-use of the savoury yoghurt adds to its appeal. From standard spoon to mouth consumption through to a salad dressing, dip, spread or additive to sauces and curries. 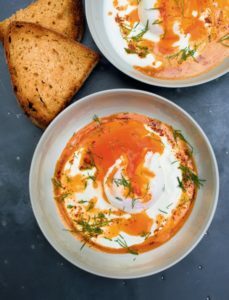 Speaking on the savoury yoghurt trend, John Fout, co-founder of New York based restaurant Sohha Savoury Yogurt, says that around the globe, the natural tartness of Greek yogurt is embraced. Fout says, “In most places where the yogurt culture started out — [the] Middle East, India — is where yogurt has its longest routes, everybody eats yogurt savoury, with curries, spices, pulses and oils. It was only in the 1940s when yoghurt was introduced into America did they decide to make it sweet”. 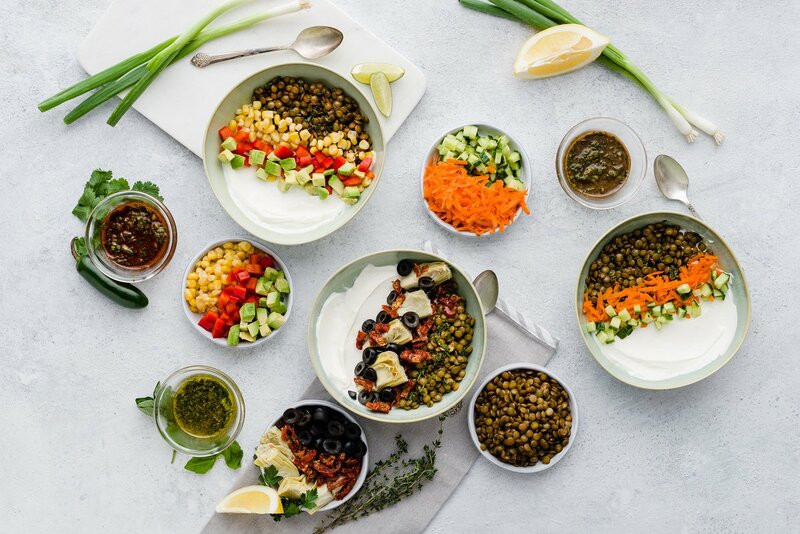 In the UK, you can taste a variety of savoury yoghurts at fast casual dining restaurant Mandira (Covent Garden, London). They recommend the creamy snack on its own, with toppings, or as an ingredient to be used in savoury preparations. 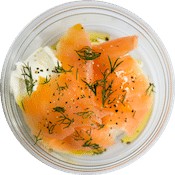 At Mandira you can have Greek yoghurt topped with: cucumber and mint, salmon and dill, vine leaves and green grapes, aubergine puree and tomato, and avocado and beetroot. There are also a range of sweet options on offer too. The national sandwich-shop chain Pret a Manger has also started experimenting with savoury yogurt. They recently introduced two new sandwiches—Coronation Curried Chicken and Spiced Indian Chickpea— which come with a curry yogurt sauce flavoured with curry powder, cayenne, mango chutney and lemon. Many celebrity chefs have also jumped on the savoury yoghurt band waggon: Yotam Ottolenghi is encouraging people to douse their vegetables in yoghurt, Nigella Lawson recently featured a recipe for Turkish eggs (poached eggs, yoghurt and spices) on her television show and John Torode recently featured a recipe for spicy stewed plum yoghurt in his latest cook book. Do you think savoury yoghurts would make a good addition to your on-the-go menu? If so, it’s important to think about how you will present and serve your savoury yoghurts, keeping the yoghurt contained and the toppings intact. 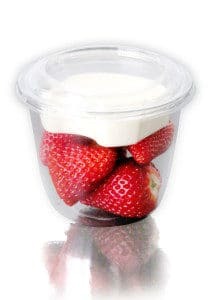 Customers carrying their savoury yoghurt on their daily commute, or back to their desks for lunch, will require packaging with a lid– and don’t forget disposable spoons and napkins. Our partner supplier Anson Packaging has developed a new range of clear plastic containers and lids called Jarr, which are perfect for serving up savoury yoghurt. 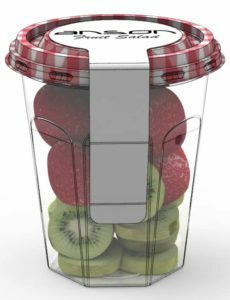 Based on the traditional design of a classic jam jar, they allow food operators to bring new trend ‘jar cuisine’ to the food on-to-go environment. They are made from recyclable high clarity PET, and come in four sizes – 440cc, 350cc, 300cc and 120cc. The Jarr lids can be bespoke printed to add extra customisation and showcase branding. Savoury yoghurts also work well in Graze pots from our exclusive brand Revive range. Developed in partnership with London Bio Packaging, Graze pots are high clarity containers containing 30 per cent recycled PET content. They come in four sizes 175ml, 300ml, 350ml and 425ml, and in addition to a lid, a pot ‘topper’ is also available for the medium, large and extra-large containers. The pot ‘topper’ allows foodservice operators to effortlessly keep wet and dry ingredients separate. Speak with your local Bunzl Catering Supplies branch today to discuss the most suitable containers for serving savoury yoghurt, and our range of cutlery and napkins.